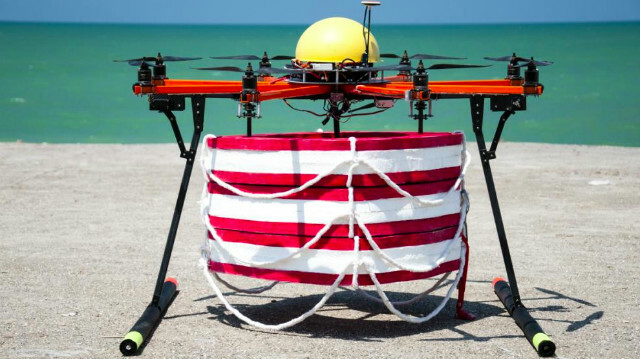 Researchers have developed a GPS-enabled robot that can fly over large expanses of water to drop life life-saving gear near people who are drowning. A working prototype of the robot, called Pars, was developed by RTS Lab, an Iran-based company, which also tested its capabilities in open water. Over the course of four days in August, an RTS Lab team conducted a battery of tests on its prototype in the Caspian Sea. The location was chosen partly because it's been the site of several drownings in the past few years. The team tested Pars' stability during flight, the accuracy of the life preserver release mechanism, and the bot's performance in day and night-time conditions. According to RTS Lab, the prototype met the team's expectations. It was able to fly for 10 minutes at a top speed of 10 metres/second before needing to recharge. This gives it a maximum range of 4.5 km, making it ideal for emergencies along coastlines. It has an edge over its human counterparts as it can bypass treacherous waters.